It has become increasingly clear that many large enterprises are not very good at innovation. 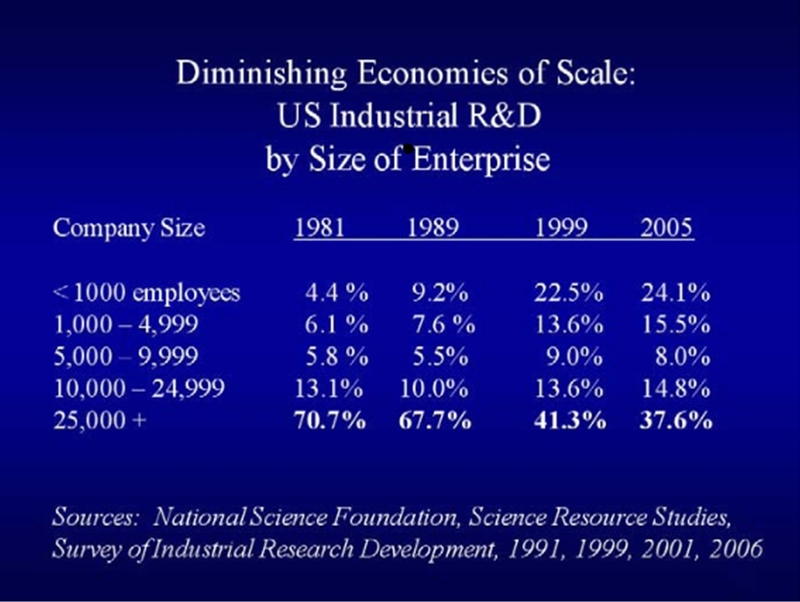 The chart below, courtesy of Robert Ackerman, Founder of Allegis Capital, in the February 2011 issue of Global Corporate Venturing, shows that the share of U. S. Industrial R&D investment of corporations with 25,000 or more employees declined from 70.7% in 1981 to 37.6% in 2005. During the same period the R&D share of companies with 1000 or fewer employees increased from 4.4% to 24.1%. This clearly supports the primary Capital Matters theme that future jobs growth will come from small and medium sized privately held businesses. But where will the capital come from to fund these businesses? Even with today’s resurgence, IPO markets are a dim reflection of past glories. As a result both venture capitalists and private equity firms increasingly recognize that they must depend on acquisitions of portfolio companies by larger strategic firms as the only realistic exit for most investments. Increasingly strategic investment/acquisition has become a critical element in such firms’ growth paths as these larger entities control customer bases critical to the smaller firms’ success. The larger strategic entities are increasingly investing in early stage entities, often through formal internal venture capital organizations, to provide a window into new technologies and access to entrepreneurial talent.